Wow!! Love that spooky tree!! Awesome treat bags!!! 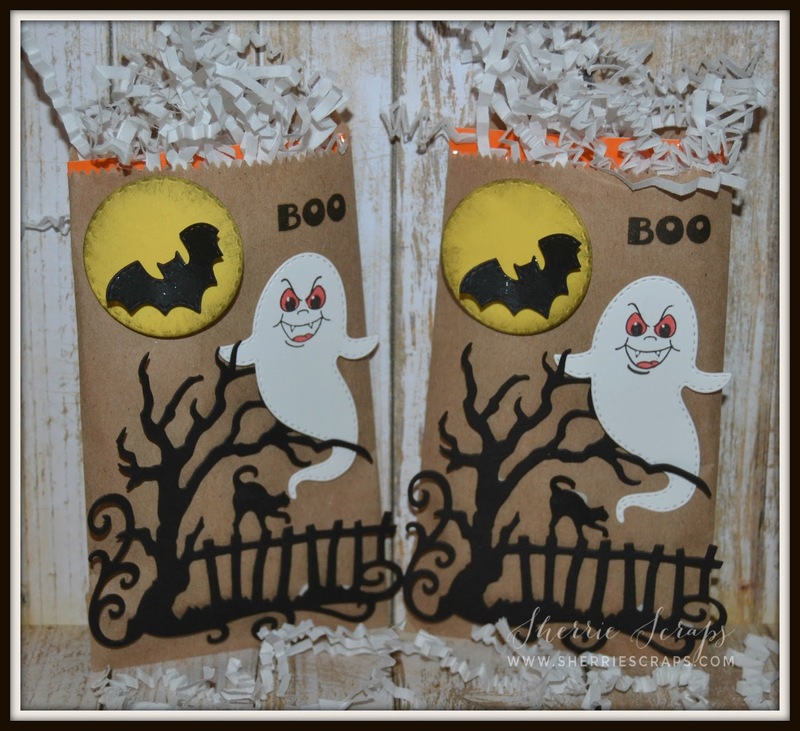 Your treat bags are so super cute! I just love the fun scene you created! 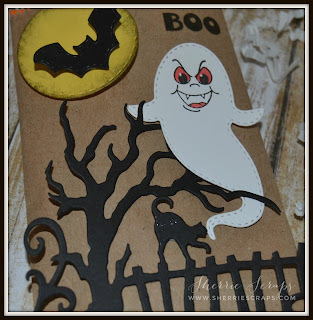 That ghost is so adorable, love the Peachy face you used! Fabulous treat bags!! Love that ghost!!! Have a great day. I love the cute PK faces on the ghosts and the fun scene!! Super fun treats!! Awesome job my friend!! I LOVE your spooky little Halloween treat bags! That face on the ghost is awesome! Don't you just love when you can use up some scraps! I sure do! 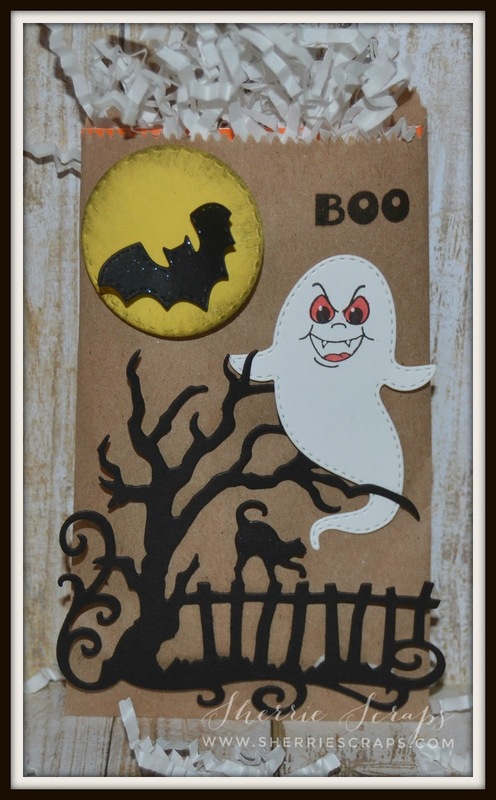 I love your treat bags, especially that face on the ghost ~ so spooky!! Thanks for playing along with us at Scrapy Land Challenges! Sherrie, your treat bags are adorable! The ghost is fabulous with its spooky face and the landscape is amazing. Beautifully designed, my dear friend! They will be enjoyed even more than the sweet treats nestled within. I hope you're having a lovely week, my dear friend! These are sooooooooooo fun! LOVING the ghosts!!!!!!!!!!!!!!!!! Spooky cute. Love the scene you crated and the face is too cute. Love it. Hehe the expression on the little ghost's face makes me smile....so cute and scary!!! What awesome treat bags, Sherrie!! These are both adorable and scary at the same time!! The ghost face is too cute!! I love how you have the ghost floating through the tree!! These are fabulous my friend!! So perfect for Halloween treats!! So Very SPOOKY COOL Sherrie! LOVE the Scary faces on the ghost! 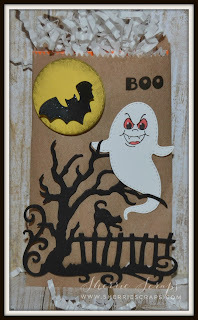 Really FUN Halloween Projects! Love them! Have a great day! What wonderful treat bags Sherri ... wow that ghost is scary! LOL Thanks so much for playing in our ‘The Leaves on the Trees’ challenge at Dies R Us! Please come back again soon! What a cute treat bag! Thank you for joining us this month at Jaded Blossom! These are super fun! Love how you used all the dies! Thanks for playing along at Jaded Blossom! Oh I love this so much and yay for using scraps. I just love when I can use my huge pile of scraps! Super Spooky Sweet!! Thanks for playing along with us at Jaded Blossom!